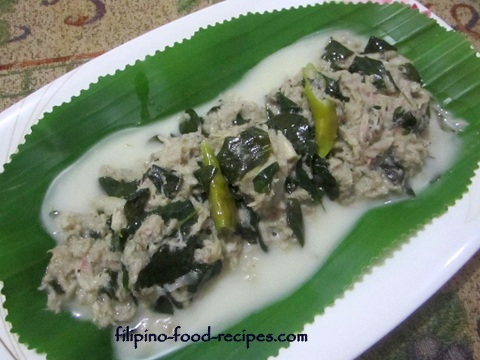 Kinunot na Pagi is a Bicolano dish of flaked stingray fish or pagi cooked in a creamy coconut sauce. The term Kinunot is a Bicolano term for flaking or hinimay in Tagalog. The stingray or pagi came in a 4" x 4" square fish meat when I bought it from the wet market, with the head and tail already removed. Cooking the stingray was quite a challenge, I had to boil it first in water with a little vinegar and ginger to remove some of the funky(malansa) taste and smell. After which, I drained and dumped the boiling liquid. Then I marinated it in vinegar to further neutralize the fishy taste. It is a good tasting dish but if one doesn't know how to properly prepare the fish, the taste and smell could be repulsive and off-putting. 1 Boil the Pagi or Stingray fish in water, vinegar and a thumb size ginger. 2 Drain and flake the fish. 3 Soak the fish in vinegar for at least an hour, then rinse in water and discard the vinegar. 4 Saute the garlic, onion and ginger in oil, then add 1 cup coconut cream and 1/2 cup water. Bring to a boil. 5 Add the fish and simmer until the sauce slightly thickens, about 15 minutes. 6 Add the remaining coconut cream with the hot chili peppers and simmer until thick. 7 Stir in the malunggay leaves.